The banking at Northburn Hill, Eyemouth is no longer cut by council staff, leaving the entrance to the town "a complete mess" according to community council chairman James Anderson. 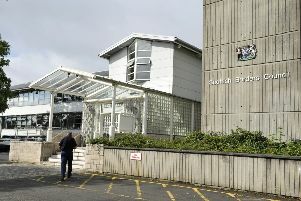 Scottish Borders Council leaders have faced uproar from opposition councillors furious about cutbacks to grass-cutting and maintenance in their wards. At Thursday’s full council meeting, both Hawick and Hermitage councillor Davie Paterson and Jedburgh councillor Jim Brown took the ruling administration to task over the latest cost-cutting measure that will see some parks and grass verges cut just once every three weeks. “A significant part of the change was moving general amenity grass to a 20-day cutting cycle from a ten-day cutting cycle. “Five amenity areas will remain on a ten-day cutting cycle and therefore this is a change to some, but not all, areas of grass. The change to the grass cutting regime is a talking point in many Berwickshire communities at the moment and one Foulden resident said this week: “In our local churchyard the grass is now between 6-9 ins high complete with sizeable thistles and looks more like a farmers field than a sacred place. “When eventually this is cut the grass is left lying and as well as looking awful will kill the fresh grass below. “Areas around the headstones have recently been poisoned which does not improve appearance. This is all disrespectful to family and friends who have been interred there and also very upsetting to their families.